"March through May is an “iffy” proposition for us mountain fly fishers. There are options if one is willing to travel. Below are some unheralded waters away from the Sierra that one might consider. The trail-head to KIRMAN LAKE is near the highway 395/108 junction, below Sonora Pass (9100’). Because there is sparse shoreline casting room; a floating device is suggested. So, pack your float-tube and trek or bike the mild gradient, 3 mile trail to this few acre lake. 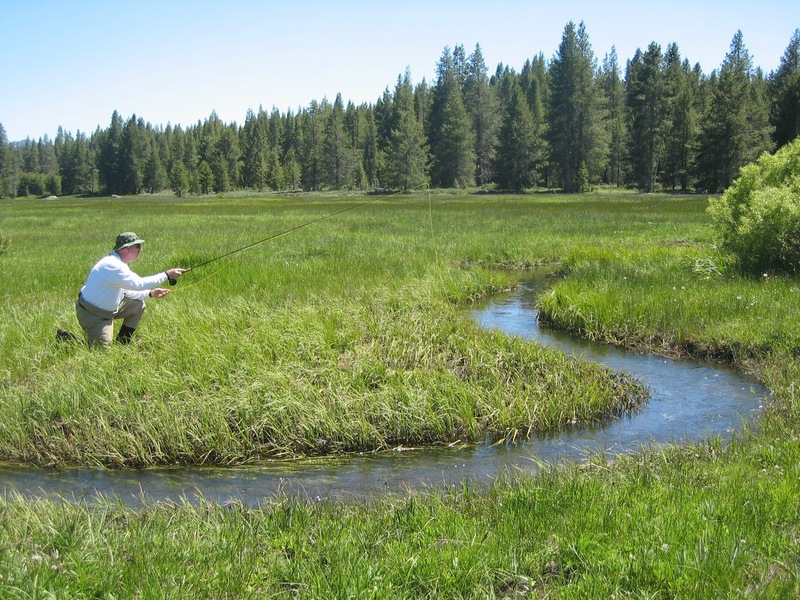 This east slope, Sierra still-water is known for its trophy brook trout. Each year hefty brookies to 3 pounds-plus are netted. They display a disproportion girth relative to length…really FAT. Another unique attraction here is the chance at Lathontan Cutthroat to 20”. The regulations here are; barbless artificials only, minimum 16”, 2 take. The prime tactic here is casting a clear, full-length, intermediate sinking line with a size 14-16 scud pattern. The retrieves are a methodically slow hand-twist retrieve or short bursts and quiet pauses. Another option is using size 18-22, dark midge pupae. If there is a calm surface, dead- drift your pattern in the film and patiently await it getting sucked-in. When there are ripples use a midge larva pattern under an indicator. Have some black leech patterns and olive Matukas. You will not hook big numbers of trout here, but the few you encounter may be the largest brookies you ever catch other than Maine or Newfoundland “square-tails”. LAKE McCUMBER, off of highway 44 east Red Bluff, is ideally suited for car-toppers (no gas motors), pontoon-boats and float-tubes. 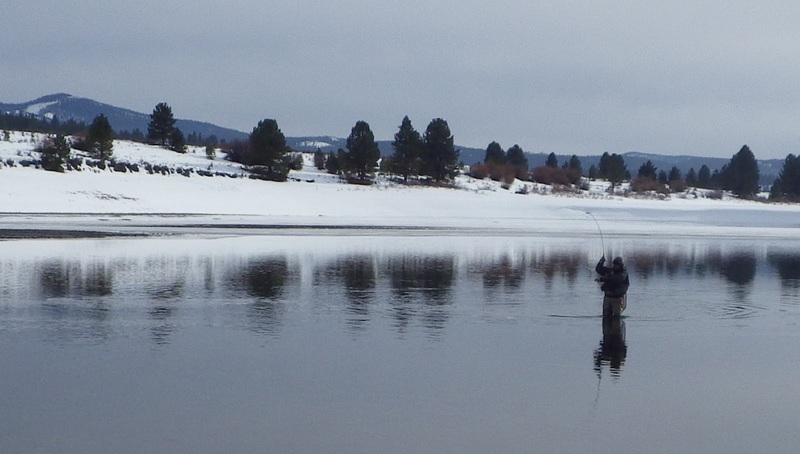 The spring melt will keep the waters cool through May, and then temperature will be a factor in your fly fishing success. If the water starts to heat-up, probe sub-surface in the submerged channel of the North Fork of Battle Creek or the dam face; the deepest parts of this shallow lake, seldom more than 10’. The lake receives hatchery trout yearly. 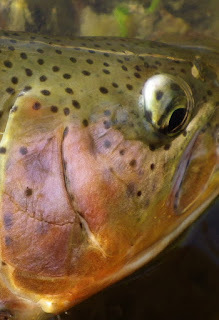 There are wild browns and rainbows present; progeny spawned in the inflow creek. Fish are commonly 9”-12”, some to 16”-17”. There is a rarer chance for 20-incher. Bugs present are the standard lake variety. Dark chironomids and Callibaetis represent the bulk of the bio-mass. In the absence of visible surface feeding, regulars suspend nymphal or larval imitations 3’-5’ under an indicator. The retrieve can be a dead-drift “bob” or pro-active “rise & fall.” Fast-stripping Krystal-Flash Buggers trailing size 14-16 beadhead Pheasant Tails is a good tactic in the absence of top water activity. The regulars use “slime” lines and long leaders. When stripping a streamer use a “countdown” method; finding the proper depth where the fish are located. LEWISTON LAKE, off state route 299 west of Redding, is below Trinity Lake’s Clair Engle Dam. It is an elongated tail-water lake with 15 miles of shoreline. The flows are relatively constant which bodes well for finding prime feeding areas because the trout do not move around a lot. 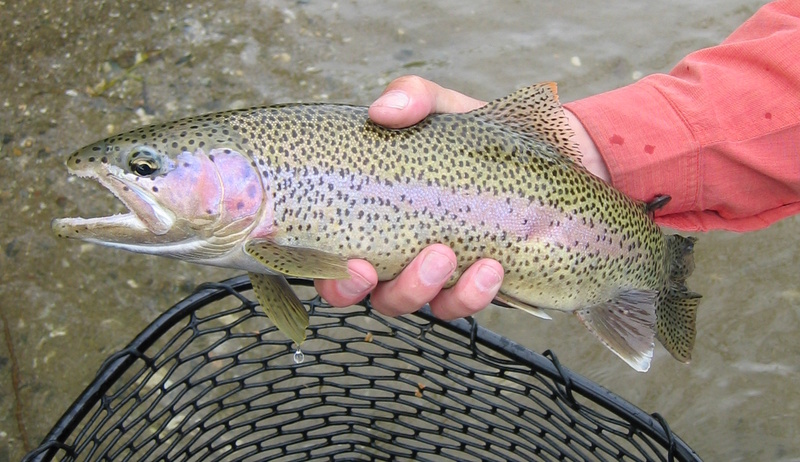 The lake is heavily planted with rainbows, but there is a chance at hooking wild browns and rainbows to 20”. Lewiston’s thick weed beds are infested with Callibaetis nymphs. Cast a floating line with size 14-18 nymph and emerger patterns attached to a 12’, 5x leader. You can use a slow, hand-twist retrieve or employ a more rapid, “stutter” strip. Present the fly adjacent to, above or through the open channels of weed beds. When there is an emergence, cast a Callibaetis cripple up-current of a showing fish. An effective tactic is to track the direction of a steadily surface-slurper and cast ahead of its next anticipated ingestion of a natural. During morning and evening sessions, when there is less wind; dark, chironomid pupa patterns, in sizes 18-22 will get takes; black or red are suggested colors. During April, southern California’s King Harbor in HERMOSA BEACH provides salt water fly fishing for 1-4 pound bonito and mackerel in the 2 pound range. The bonito are drawn in from the ocean by warm-water discharges originating from a small power plant in the harbor. There is half-mile of productive water within the east side of the harbor’s man-made ocean barrier. Fly anglers use 6 and 7 weight outfits. Boats are required and you can rent 14’ outboards at Rocky Point Marine. Fast-sinking, shooting tapers or full-length lines are used. Scan the harbor for diving seabirds; get there, the bonito and mackerel will be feeding on sardine or anchovy. The best retrieve is a long, fast-strip skirting or within the bait balls. Size 2-4 blue/white or yellow/white Deceivers and chartreuse/white Whistlers are used tied to 7-1/2’ leader with 2X tippets . The SAN DIEGO area oceanfront sands provide fly angling for barred and sand perch, complemented by fewer halibut. The perch are 8”-14” and the average halibut is 2-3 pounds. Torrey Pines and Black beaches are productive spots. One’s best chance for halibut is at Mission Beach. Prime angling is more keyed to time of day rather than tide movements. “First light” is the best time, because low-light limits feeding visibility of the predator birds. Surf anglers use 6-8 weights and sinking shooting-heads. Size 2 chartreuse Clousers and the fly angler’s preferred shrimp pattern are good choices. Striped-bass start appearing along the coastline south of SAN FRANCISCO during early spring. It is a little-noticed sport fishery. These are smallish “schoolies” in the 3-10 pound range; the big ones appear during late-summer. The hard-core anglers patrol the coastline along Highway 1 with their binoculars, cell-phones and 9 weight single or two-handed rods “at the ready”. They are armed with flashy 2/0 flies cast via varying sink-rates lines. HINT: One needs a fine-tuned reel and plenty of backing in case an early-arriving pin-stripper is mixed with the single-digit-poundage fish. Your best hooking prospects occur on the big incoming tides. The powerful surges drive anchovy “balls” closer to the shoreline where the stripers corral, pursue and push the bait-fish towards the shallow beaches or vertical rock outcroppings. Sea-birds are one indication of stripers forcing the baitfish near the surface. Look for silver flashes in the wave lines. Avoid full moons and low volume incoming tides. One’s tide charts are vital for success. Trout water in the south state? You betcha! Spring is a good time to explore four small creeks that are open all year. Los Angeles county’s WEST FORK OF THE GABRIEL is southern California’s first “no-kill” water, featuring barbless artificials only. The ZERO take “section B” water is from Cogswell dam downstream to the second bridge upstream from the highway 39 bridge. From the locked USFS gate there is a 7 mile, paved road all the way to the dam. The USFS strictly enforces the parking; be sure to get a parking permit from them. Anglers use bikes on the road that parallels the creek. 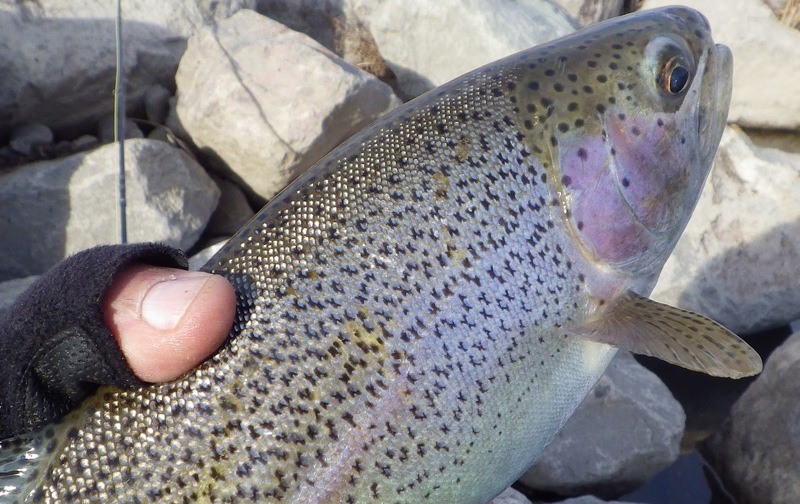 You will encounter 9”-11” hatchery rainbows. In the upper reaches closer to the dam you’ll find 6”-9” wild rainbows. Caddis is king here; size 16-20 attractor dries are all you will need. March to mid-April are suggested times because the water warms in May. The EAST FORK OF THE SAN GABRIEL, a tributary of the West Fork, has planters in the lower two miles with wild browns appearing as you progress further up the watershed. Unlike the West Fork, you have to hike; the trail is too narrow for bikes. BEAR CREEK is east of Redlands via highway 38 on the south side of the San Bernardino Mountains. It is a tailwater flowing from the dam at Big Bear Lake. The 12 miles from the dam to the confluence of the Santa Anna River is open all year. Use of barbless artificials only with a two-fish limit is the law. Most fish are smallish, 12” being large. 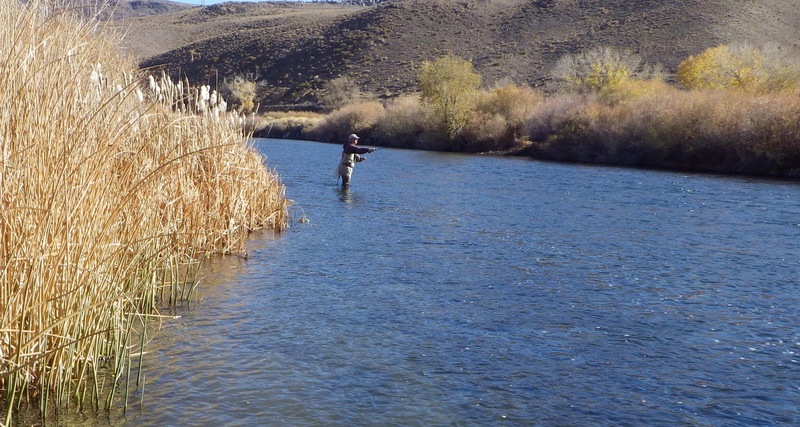 In the upper reaches you will find a brush-choked canyon creek, averaging about ten feet wide. There is more open terrain as one progresses downstream; the caveat being gusting afternoon winds. A 4WD is advised, most especially after rains. The advantage of visiting this creek now is that the weather is still cool…making the rattlesnakes inactive. 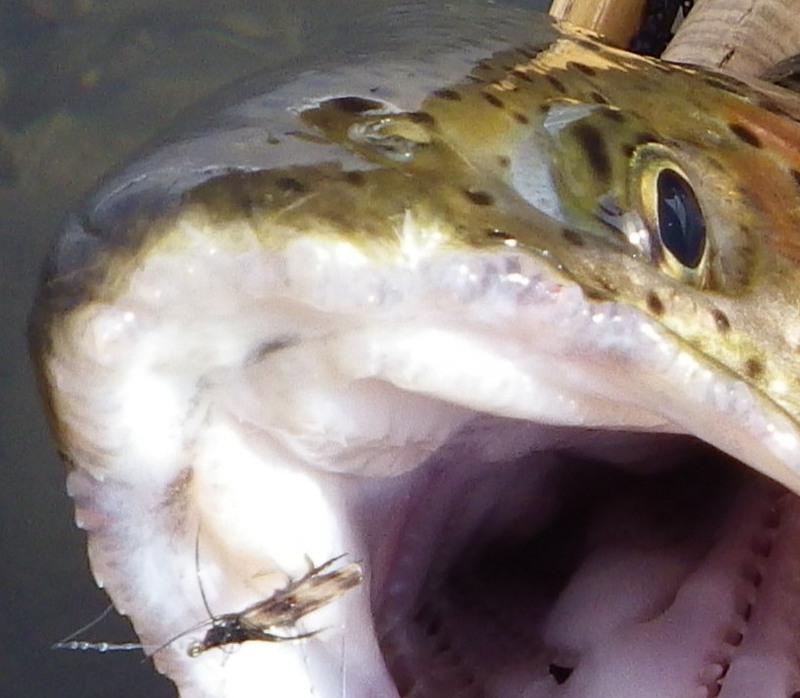 Searching patterns such as sized 14-18 Elk Hair Caddis or Humpies are suggested. One targets smallish wild browns and larger stockers near the Santa Anna confluence. The upper reaches of DEEP CREEK, although open all year, may have limited access because it is located at 5000’-6800’ elevations. The lower stretches, near the town of Hesperia, are a reasonable choice. The creek is mid-way between LA and San Diego and is within the San Bernardino National Forest. There are 20 miles of special regulation water requiring barbless artificials and a limit of two. It starts near the resort at Lake Arrowhead and goes downstream to Willow creek. 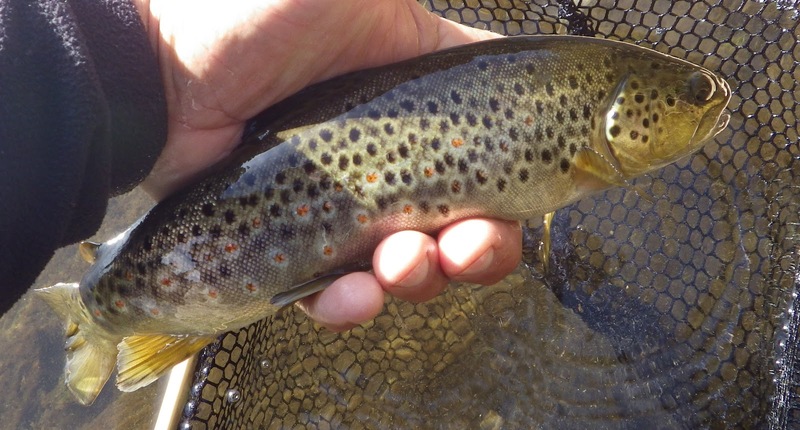 The quarry are all wild fish; predominately rainbows with a sprinkling of browns. Prospecting dries, such as Adams or Royal Wulffs in sizes 12-18 should produce, complimented by a size 16-18 Parachute Baetis if you encounter a cautious trout. A number12-14 Gold-Ribbed Hare’s Ear or a size 8 stonefly nymph are used in the riffly spill-ins at the heads of deep pools; to entice the larger fish (browns to 18”). Expect trout in the 8”-12” range. " Hi Roy---I’ll be at the Pleasanton Fly Fishing Show this Friday-Sunday. I’ll be in the Truckee Guide NetWork booth. Also, I’m giving a presentation in the Destination Theater at 3PM Saturday…building P ….either option come by and say hello. I hope you're having a good winter. We need snow…coming in tonight & Tuesday. I leave for the show on Wednesday….when it is dissipating. I am probably going to be on Lake Tahoe around March 21, on a trip with folks from work. They will want to ski during the day. If we get some nice snowfall it should be good early spring skiing….There is a good base from the snow received in December. 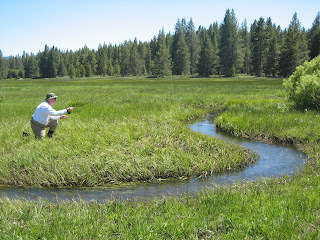 What are the odds that I can find some decent fishing on the Truckee or LT at that time of year? Good…to potentially really good. Biggest fish of the year are caught now through early spring and then again all of October until the snows fall again. Caveat is dependent on access and amount of snows received until your arrival. 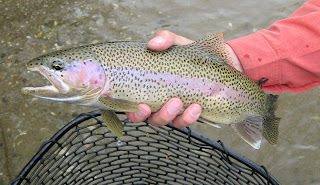 Actually we’re fishing now in both California & Nevada…some very nice trout to 23” RB (San Juan Worm) are being caught. 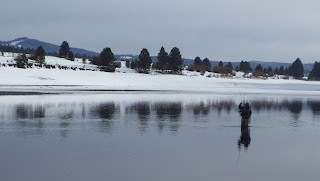 A buddy got a 21” RB on a dry, size #18 Black Winter StoneFly this week….and another at 18” on a dry again. Both were “showing” surface-feeders. Otherwise nymphing, in the absence of heads, snouts or slow & deliberate “head-dorsal-tail” rises. Call before you arrive and I’ll give a current report. Could be good fly angling. Well, we need snow; been awhile after the nice falls we had in December. As usual as I prepare for the upcoming Pleasanton Fly Fishing Show (Feb 22-24); I have to decide when I to leave the mountain during the upcoming storm. Fortunately it sounds like it is going to be pretty moderate...only a foot or bit more. I have been fishing.We have had some pleasant days with good access to the water. No numbers but nice healthy winter RainBows...some on dries...Little Black Winter Stoneflies are a starting along-side a sparser Baetis emergence.